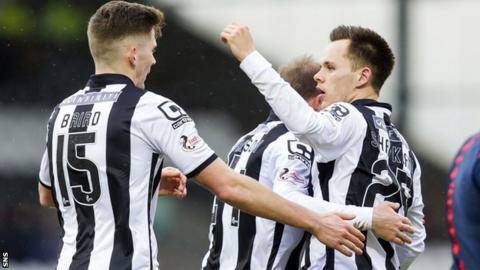 St Mirren kept their Championship play-off hopes alive with a hard-fought home win over Dumbarton. Lawrence Shankland had a shot superbly blocked by Sons goalkeeper Mark Brown, then at the other end Frazer Wright's header was scooped off the line. The second half was tight until David Clarkson squeezed a pass through to Shankland, who found the far corner. Clarkson missed an achievable volley at the back post, but Alex Rae's men had done enough. Match ends, St. Mirren 1, Dumbarton 0. Second Half ends, St. Mirren 1, Dumbarton 0. Corner, St. Mirren. Conceded by Kevin Cawley. Corner, St. Mirren. Conceded by Mark Docherty. Foul by Rocco Quinn (St. Mirren). Kevin Cawley (Dumbarton) wins a free kick in the attacking half. Foul by Gregor Buchanan (Dumbarton). Corner, Dumbarton. Conceded by Andy Webster. Substitution, St. Mirren. Steven Thompson replaces David Clarkson. Kevin Cawley (Dumbarton) is shown the yellow card for a bad foul. David Clarkson (St. Mirren) wins a free kick in the attacking half. Foul by Kevin Cawley (Dumbarton). Attempt saved. David Clarkson (St. Mirren) right footed shot from outside the box is saved in the centre of the goal. Substitution, Dumbarton. Kevin Cawley replaces Jon Routledge. Substitution, Dumbarton. Kler Heh replaces Jordan Kirkpatrick. Grant Gallagher (Dumbarton) wins a free kick in the attacking half. Attempt missed. Kyle McAllister (St. Mirren) left footed shot from outside the box is close, but misses to the left. Substitution, St. Mirren. Jim Goodwin replaces Scott Agnew. Attempt missed. Tom Walsh (Dumbarton) right footed shot from outside the box misses to the right. Attempt saved. Scott Agnew (St. Mirren) left footed shot from outside the box is saved in the centre of the goal. Grant Gallagher (Dumbarton) is shown the yellow card. Jordan Stewart (St. Mirren) wins a free kick in the defensive half. Foul by Grant Gallagher (Dumbarton). David Clarkson (St. Mirren) wins a free kick in the defensive half. Foul by Steven Saunders (Dumbarton). Attempt missed. Grant Gallagher (Dumbarton) right footed shot from outside the box misses to the left. Substitution, Dumbarton. Donald McCallum replaces Scott Taggart. Foul by David Clarkson (St. Mirren). Tom Walsh (Dumbarton) wins a free kick in the defensive half. Attempt missed. David Clarkson (St. Mirren) right footed shot from the right side of the box misses to the right. Jordan Stewart (St. Mirren) wins a free kick in the attacking half. Goal! St. Mirren 1, Dumbarton 0. Lawrence Shankland (St. Mirren) right footed shot from the right side of the box to the top left corner. Assisted by David Clarkson. Attempt saved. Rocco Quinn (St. Mirren) left footed shot from outside the box is saved in the centre of the goal. Mark Docherty (Dumbarton) wins a free kick on the right wing.